The objective of the Medicine Reminder Using DS1307 & I2C Protocol project is to remind the medicines to the patients at a regular interval of the time according to the prescription. 1. The medicines are reminded to the patients according to the time & doctor’s prescription. 2. Display of digital clock is made on HD77480U, 8-bit data bus, 2 line Liquid Crystal Display Unit. 3. User can enter & change the medicines dynamically by using 4×3 matrix keypad. 4. DS1307 is incorporated in the project to retain the clock & calendar during power failure. 5. DS1307 is incorporated with power failure detecting circuit to switch on to the battery source whenever external power supply is turned off. 6. 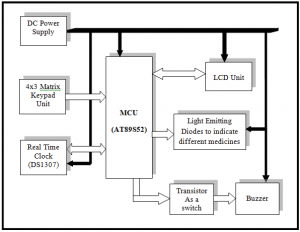 I2C (Inter Integrated Circuit) protocol is used as an interfacing standards to conserve the number of port pins during communication between RTC (Real Time Clock) & microcontroller. 7. 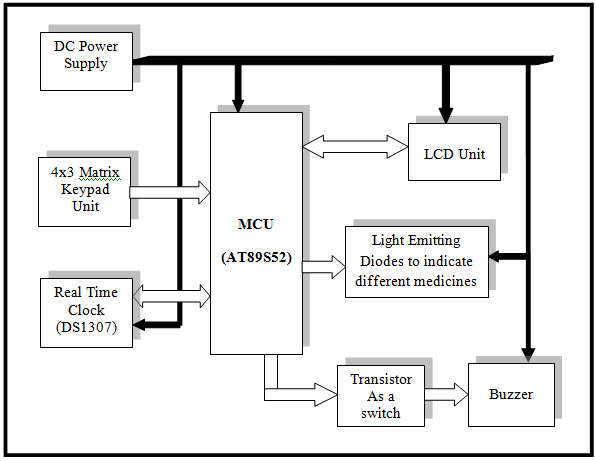 Hardware is incorporated with set of LED’s representing a specific medicine followed by an alarm circuit for turning on buzzer whenever entered time matches. 1. Training will be conducted for duration of 20 days on simulator tools and IDE used in this Medicine Reminder project along with the basics of microcontrollers. 2. Student will receive a certificate from Concern Research & Development Center for this project. 3. All pre requisites like Medicine Reminder abstract, flow chart, algorithm, circuit diagram, block diagram will be provided at the time of abstract submission. 4. Medicine Reminder Hardware kit along with its source code will be provided at the time of delivery.